One of the most important events in humanity's brief history will be our transition to a space-faring species, this event will require daring, innovation and drive. Another significant event will be the end of traditional economic growth. The timing of these two events may be fundamental to determining our ability to continue the expansion of knowledge and the associated rapid growth in technology and human capabilities. If you apply a logical mind to the realities of the physical planet we live on, its clear our growth based economic system cannot continue. If we take the view shared by most Economists, there is a demand for continued economic growth, year-on-year percentage increases, it is a little scary to see where this will eventually lead us (its an exponential curve of never ending consumption). Assuming we are able to continue economic growth at a rate of 2.3% per year, its possible to show that we have at most 275 years before things come to a screeching halt. This is not due to some financial limitation, but due to real physical limits of life and the planet we live on. If this statement seems absurd, read the links above (if maths and science are not your thing, you might need to find a maths geek to read them and then have a conversation about implications with respect to economic growth etc). The reality is that it would be physically impossible for humanity to continue a 2.3% growth rate right up to this end point, but it does quite explicitly show that it cannot and will not continue forever. Controlled transition to a steady state economy with opportunities for continued prosperity and the enrichment of human society and culture. Become a space-faring species and export our economy (and associated exponential growth) into the wider solar system and the universe beyond. Choosing option 1 is likely to shut the door on options 2 and 3 for a very long time, if not forever. Options 2 and 3 should be achievable either on their own or together. If we can make our way to option 3, the wider human economy may continue to grow out into space with the unbounded limits that traditional Economists and their theories desire and require. In my opinion, aiming for option 3 with an interim plan to transition smoothly to a steady state economy is a wise choice. It buys us time to get things right. When you look at the rest of the world, there are a lot of solar PV installations happening out there. I’m not talking about hobbyists and niche deployments but industrial MW scale energy plants. Admittedly, it follows a boom and bust cycle that’s driven by the whims of governments who support renewable portfolios....sometimes. Looks like Australia is in for another spin on the merry-go-round with the results of the most recent election. Oh well. With solar, it’s always a bad idea to espouse “shortermism.” However, when you look at the higher-quality, super durable gear - IEC 61701 certified monocrystalline modules, AS/NZS 4777 certified grid-connect inverters, AS/NZS 1170 rated roof mounting - there’s a lot of long-term value there. 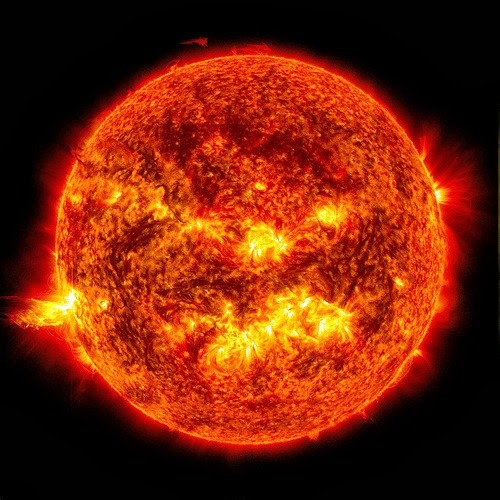 Everyone is talking about solar PV grid-connect at the moment, but really that’s only one aspect of energy management that companies need to think about. Other aspects are: how and when you use energy, how to intelligently conserve power, what the weather is going to be like, how much solar will deliver as a percentage of total consumption, and all the inter-related data that comes from the dynamic interaction of these daily trends. Not in abstract generalities, but for your business specifically. While in NZ there is ample renewable power - world-leading levels in fact! - it shouldn’t stop our engineering community from developing the tools that let companies manage those energy and financial flows themselves. Given that there’s a large contingent of “small to medium sized enterprises” in NZ (SMEs if you want to talk in biz jargon), shouldn’t there be a set of services that hand over the energy management reins to the SME’s COO? That is, not a technologist but a business focused person. Yes: the solar hardware is available today, and skilled installers are doing some great work in NZ. In fact, there’s actually a very compelling business case to be made for quality grid-connect systems PV in NZ. But what about the business tools that let an SME manage, measure and report how their specific energy flows - and cash flows - are going. Are those tools available? You may ask: “Why do we need them - isn’t the power bill good enough?” Well, it’s true that the data is available each month, but what about acting on that data - as it happens? For example: say your target SME is a distributor with a large warehouse roof. Their hours of operation are standard daytime hours, which is when they use the majority of their power, lights, forklifts, computers. It would make sense for the solar energy hitting that vast roof to offset the power bills as much as possible. With some smarts on maximizing locally-generated energy, turning things off, maximizing loads during sunny hours, you could provide empirical calculations on energy use for immediate reporting and financial forecasts. Studies show that people who have a simple visualization of their energy use save between 5% and 15% on their power bill. Add in intelligent solar PV self-consumption and we’re talking about active, web-based, holistic energy management. Commercial Solar PV in New Zealand is happening, but perhaps not as fast or as broadly as you’d think, for a nation with so much sun. This is because there’s no real assurance that the investment is going to be worth it. And so far, not many examples of companies that have taken the step. We see lots of smart-grid, smart-home promises for the future. But when those solutions are coming from the labs of electricity retailers....that’s like buying Hen Management Services from Mr. Fox isn’t it? I mean, c’mon - how can we really get this in gear? But things are changing, I’m thinking it might be more of a chicken-and-egg situation. If there were an easy-to-implement, solid cloud-based software made available to SMEs, along with some case studies of the benefits, there would be a lot more takers of quality solar PV equipment to offset local consumption. An SME wouldn’t have to invent something themselves, they wouldn’t have to take a risk as an early adopter. Instead, they could quickly implement an existing proven system and tweak it for their business. Business people - not technicians - could review the case studies of comparable firms and say “yep, this energy profile is very like ours - and hey, look at their results. We could do that.” The big picture result would be that, as a group, NZ SMEs could start using more locally-generated power. That means the local multiplier effect starts to kick in, and that leads to more local wealth. Real wealth, not the “wealth” of short-termers. Plus, there’s the good practice of using more renewable energy in your local community. Cool! Why not collaborate here in NZ as engineers to provide those solutions for SMEs to act on their energy use - and start building some really advanced, site-specific solutions today? One reason I say this is that there are a lot of solid technical options that are emerging to manage energy flows. Take a look at the JF2 LATA switch. This is a reliable, affordable industrial CANbus switch that gives you switching as well as state information about each circuit. Packaged in neat DIN rail compatible units, you can daisy-chain these devices across kilometers of warehouse, using standard CAT5 wiring. Not only does it save AC wiring costs - because you can avoid AC runs to the switch - but it gives you intricate, durable remote control over a multitude of circuits. Control you can implement from secure cloud-based software. And guess what? LATA is open source and made in New Zealand. But this is just the start. Here at Greenstage, we are building out that software framework, using an enterprise base, and Open Source licenses. We talk to lots of different pieces of hardware (the LATA is just one example), in a very logical, repeatable and modular fashion - employing open standards wherever we can. Meanwhile, as computing becomes ubiquitous, powerful and inexpensive, the ability to automate the collection of energy information and provide actionable steps to enterprises is now available. The need for energy - renewable energy especially - is only increasing as electric vehicles become available, while both petrol and grid power prices keep rising consistently over the long term. Can you see it? I believe that collectively, we can prime the pump by identifying SME’s requirements, and providing holistic solutions tailored to their business needs. We can start doing this by building out a NZ-based toolkit that gives them actionable options on their energy information. OK enough talking: who wants to join us on the journey? Lets make this happen! I've recently been working on improving the interface for external applications that interact with and access data from the SolarNetwork. Here is a quick update on where things are at. 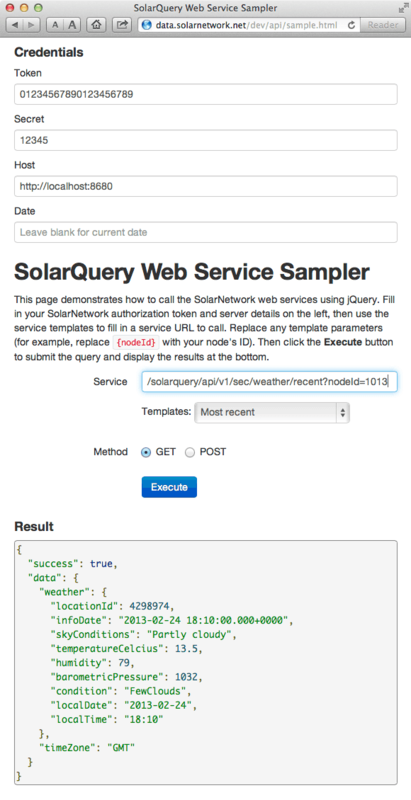 SolarQuery is the SolarNetwork application that exposes web services for querying the data collected by SolarNodes. 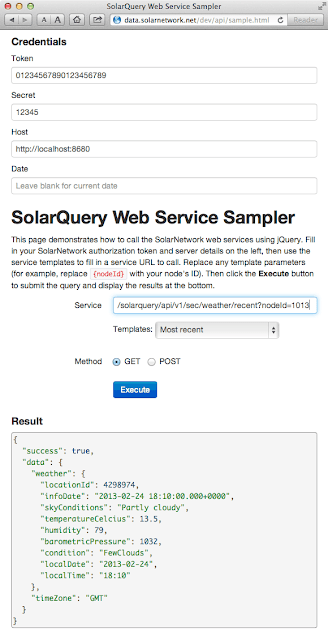 SolarQuery is what enables data visualizations like Consumption Monitor and Generation Monitor. 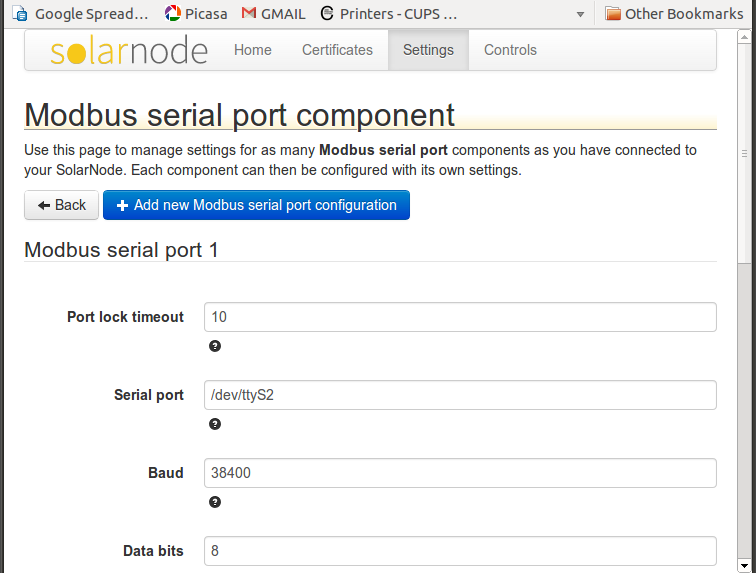 This API is still being developed, but we've created a API Sampler page that demonstrates the latest API. After the web service API is expanded and has sufficiently stabilized, we'll create more complete documentation on the API.